As usual, I wasn’t entirely paying attention and when it came time to try making it for the first time, I missed a few essential details. In short, what I thought was taco rice was not taco rice at all. 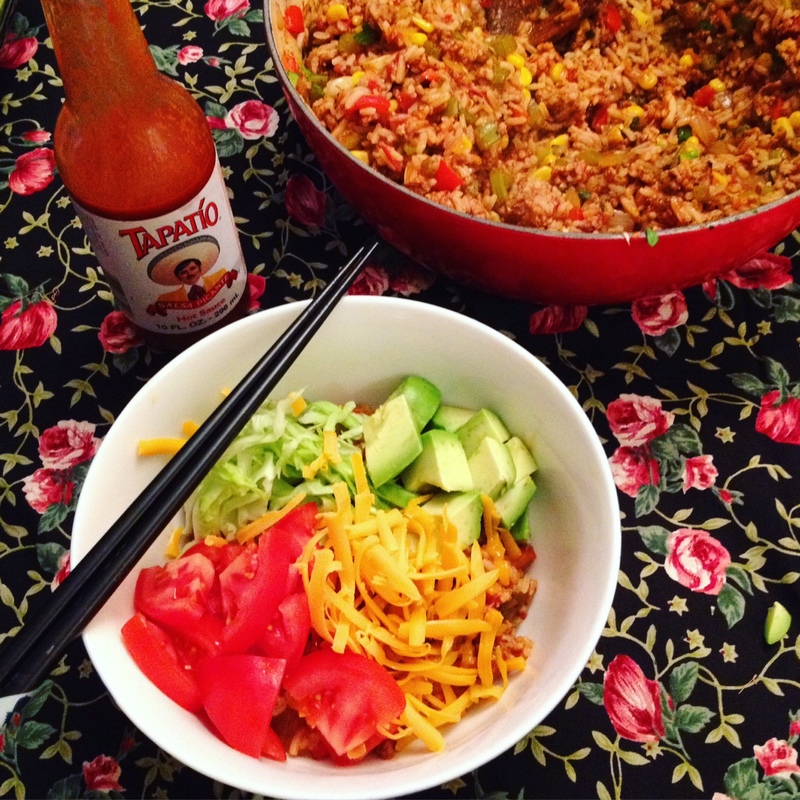 Taco rice is a layered thing – spiced, fried ground meat on top of white rice, with lettuce and tomatoes and cheese on top of that. Taco fried rice is unholy in its own way, the kind of thing you would make if you were drunk in your kitchen late at night, or if it was the 1950s. It’s exotic! Except it’s not. It’s comfort food and you should be comfortable when you eat it. 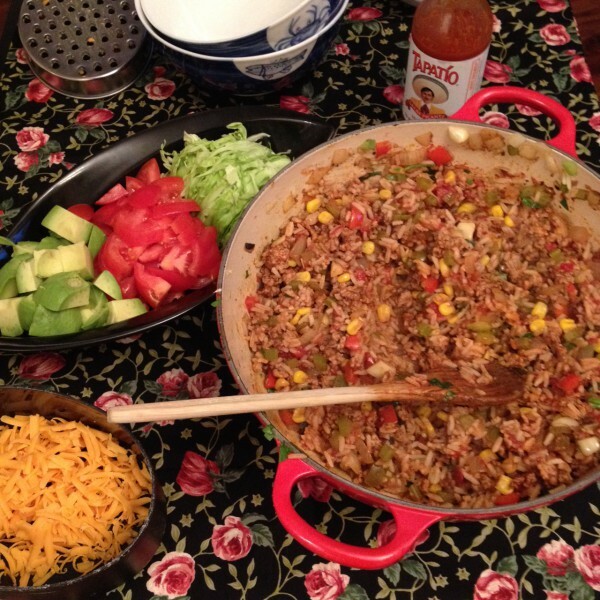 So, here’s my misinterpretation of taco rice. What is authenticity anyway? 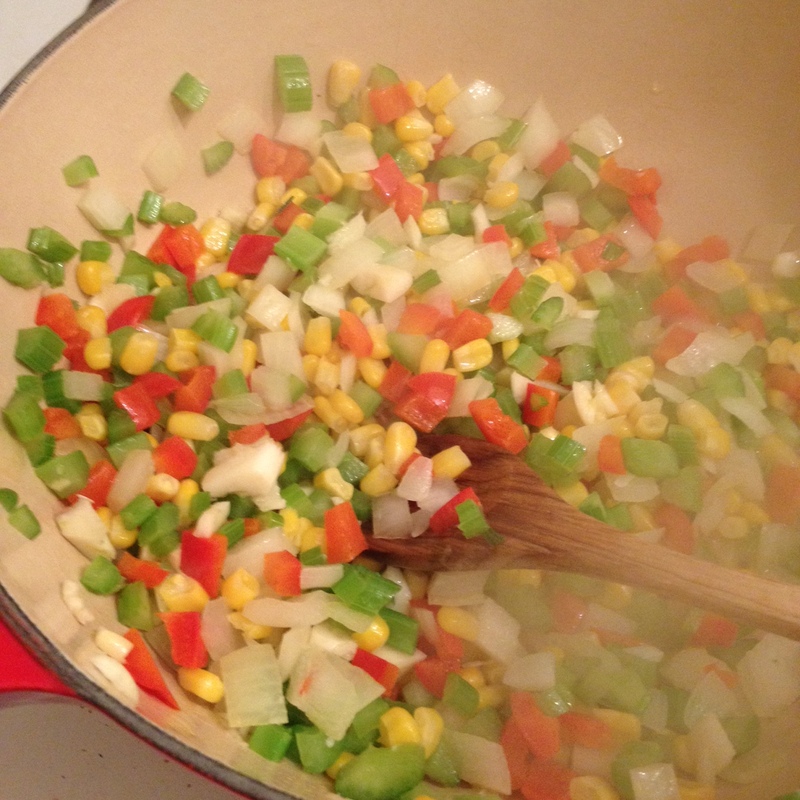 In a large pan or Dutch oven over medium heat, saute onion, celery, bell pepper, jalapeño pepper, and corn until colours have brightened, about two minutes. Add garlic and cook for another two minutes, stirring occasionally until veggies have just begun to soften. Crumble the ground pork into the pan. Add chili powder, cumin, paprika, black pepper, coriander, and oregano to the pan, and stir, breaking up the pork with a wooden spoon as you go. Cook for about five minutes, until pork is cooked through and the pan appears dry on the bottom. Add soy sauce and rice vinegar, and stir to combine. Add rice. Stir again. Add salsa, and stir. Cook for another three minutes, until most of the liquid in the pan has disappeared. Taste, adjusting seasonings as needed. Stir in cilantro and serve with accompaniments. Next > Hachee with beer and apples.